Everyone wants to do more with less. Always have, although it could be argued that doing more with more is something to aspire to, not many have that luxury. So let’s stick with the prevailing winds of doing more with less, and not just doing more, but doing it remotely, particularly in terms of production. Remote production, in particular, is getting a lot of attention in the field these days, but not so much in terms of the remote operation of fixed studios. Among many reasons for developing our Intelligent Display System (IDS), one of the primary ones was to support the advent of self-operated news bureaus in a way that enabled non-technical users to operate multiple pieces of technology at the touch of a button. The ability to do pieces to camera on their own is appealing to presenters, but it also gets the attention of financial controllers who can now trim costs because one or more technical operators no longer have to be on hand to set everything up. The entire IP-enabled idea of IDS is that from a simplified control layer on an IDS touchscreen, the talent can do everything from unlock the studio door; sit on a chair or stool that has been automatically adjusted; press the “On” button and have all critical equipment in that self-operated bureau facility armed and ready to suit the established, preprogramed preferences of the talent including camera, lighting, power and many other technical parameters, but with zero technical ability. That means there’s no need for a camera operator, lighting technician, or sound engineer. And the beauty is that, because IDS is a fully IP-based solution, you can have a self-operated studio in Cape Town that, provided the infrastructure is set up properly, can have an operator sitting in a London control room oversee what was happening in the Cape Town studio. The central idea is to automate as many of the technical tasks as practical or desired, which vastly streamlines and simplifies what can often be complicated setups that waste time and money. Although this simplifies the traditional complexity of broadcast, an awful lot still needs to take place behind the scenes, but the people who use remote production facilities don’t need to know, or care, how it all works any more. All we care about is that it does what we want it to when we want it to. However, just being able to press a button to make multiple things happen isn’t – on its own – enough. Users expect – as any of us would – the highest degree of quality and reliability. One way to ensure that, is through the likes of our new EMU3, which is a remote-access power unit, and our new Scheduler element, which enables users to remotely schedule a certain area to power up and set up before the user even gets there, and turn off automatically at a scheduled finish time, there’s no need to ensure anyone’s around other than the talent. The talent doesn’t even have to turn the lights off. This comprehensive technical package is, again, designed for non-technical users. 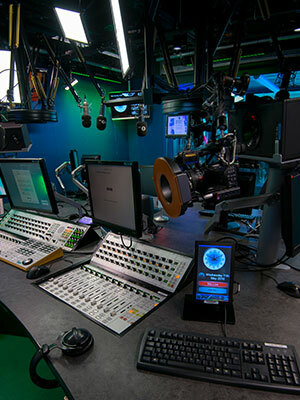 If you can navigate a programme guide, you can use an IDS-equipped remote studio just as easily. IPE has taken care of all the complicated technology. All the user has to do is turn up, press a button, and do what they do best without the complication or expense of additional, perhaps specialist, technical personnel. And that’s just what many of the world’s biggest broadcasters are doing right now. The reason you may not have heard of IDS-equipped remote studios is because they work so well. Quietly, deliberately and cost-effectively doing their job while saving time and money. But let’s not be narrow minded and limit this remote approach to traditional broadcast operations. OTT production facilities use IDS kit too. You can have remote studios on ships, in corporate facilities, at remote weather stations, houses of worship…the list is endless. You could even have a small studio space in your home for making videos of your cats…and you could operate it remotely without a scratch. I would be remiss if I didn’t close without mentioning that a significant portion of the industry is now moving to hosted, hybrid infrastructures where a lot of “technology” is virtualised and humming away in a data centre somewhere. IDS easily consolidates virtualised functions into multi-function touchscreens that can be located anywhere in the world. In fact, speech recognition/activation to control multiple, remote functions is probably not too far off either, but that’s for another article. Rest assured, virtualised routing panels, comms panels or whatever is needed, can easily be incorporated into IDS touch screens. In short, IDS and IPE are well positioned to capitalise on the virtualisation of our industry, localised or remote, but all while “keeping it real”.